This chair has been transformed with this cottage-y ticking stripe slipcover. Hope the client loves it as much as I do! I’ll be delivering it soon and picking up more furniture from her to slip. Have a great weekend! Gorgeous! That slip is really going to lighten up her room! I have always had a crush on ticking. I'm hearing that it's out of style. I'm going to follow your lead and my own heart instead of the trend-busters. It's CLASSIC! This slip shows why. 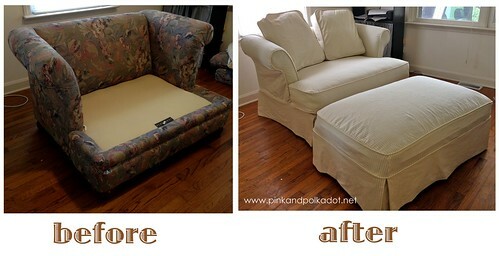 Give us bigger photos of your before and afters. Lovin the new profile pic.